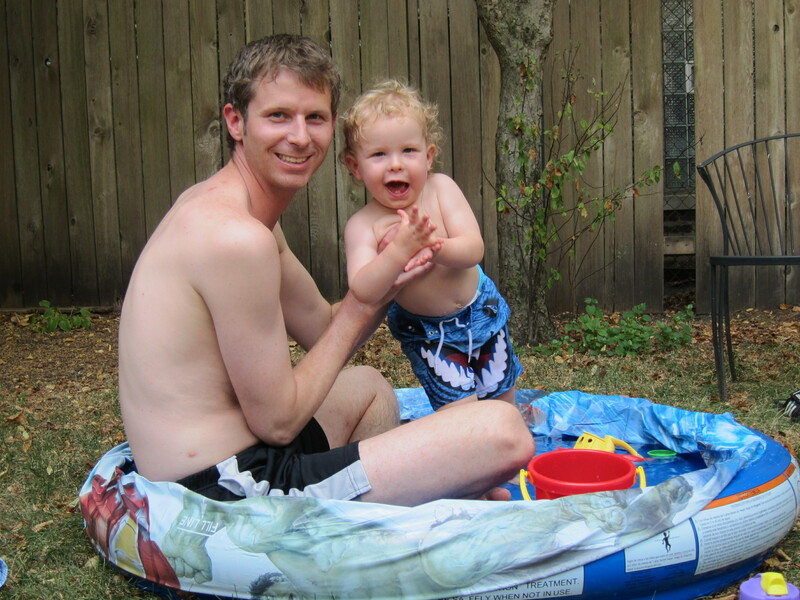 When the heatwave FINALLY broke this weekend, my husband Jeff, my son and I celebrated by taking a dip in his baby pool and grilling out! Jeff loves any excuse to throw some meat on the grill… I love a break from the kitchen… and we all love a great meal off the BBQ. Sometimes we go the simple route – hamburger, hot dog, maybe some BBQ chicken breasts. And if you have some favorite family grill recipes, please share them here… we’d love to try them out! Preheat the grill with all burners on high for 10 minutes and the lid down. While grill is preheating, rinse salmon steaks under cold running water and blot dry with paper towels. Rub a little vegetable oil on both sides and dust with paprika and white pepper. Coat a hinged wire grill basket with nonstick cooking spray and place the salmon steaks inside. In a medium-size bowl, combine the cucumber sauce ingredients and mix well with a fork. Keep at room temperature until the fish is ready. Once the grill is hot, turn all the burners to medium-high. Place the salmon on the grill, close the lid, and cook until it just begins to flake when probed with a fork and measures at least 140°F with an instant-read thermometer, 5-6 minutes per side, turning once. To serve, dish out each salmon steak with a couple of tablespoons of the cucumber-dill sauce on top. Combine the dry rub ingredients in a 1-gallon zippered-top plastic bag, omitting the cayenne if you don’t want the meat spicy-hot. Add the pork tenderloins and cover with the dry rub, coating the meat thoroughly. Seal and let marinate in the refrigerator for 2 to 4 hours. Preheat the grill with all the burners on high for 10 minutes and the lid down. Once the grill is hot, turn off the center burner and turn the other burners to medium. Place the tenderloins over the center burner, close the lid, and cook for 25 to 35 minutes turning once or twice. Transfer the tenderloins to a carving board and cut into thin slices. Serve on warm hamburger buns topped with heated BBQ sauce, dill pickle chips and some cole slaw. Posted in Culinary Creations, Family MattersTagged BBQ, family, gourmet, grill, recipesBookmark the permalink.